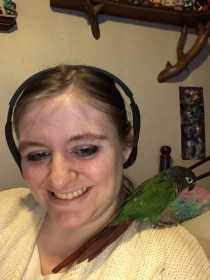 My daughter's Sam Green Cheek Conure flew out an open window and I haven't seen her since. I feel like it is my fault because I asked my husband and Sam's finance to take out the air conditioners and they forgot to close one of the windows. Emme is 1 year old and about 8 inches high. She is very friendly. She has green wing feathers with blue tips. Yellow neck and chest with a maroon spot on her and it is also the color of her tail feathers.